So here’s a guide through the posts on Permanent Style that should help answer that question. Even with the new categorisation system, I realise it’s not always easy to find the exact post you want. General advice on both buying and wearing suits. A good place to start. A much broader area this, and one that has never been covered in a single post for that reason. I recommend looking through the Reader Question and How to Wear It sections, however, as that covers most of the points. If you’re going for ready-to-wear, you should have the suit altered, at least somewhere. This post has become a reference tool for such alterations, with 37 comments since it was first posted five years ago. Remember to glance at the comments on all posts – often the follow-up question you had will be answered there. If you decide to go for bespoke, read this post. Given my colleague is in Hong Kong, bespoke is a very real possibility. But you need to know what you want, and be firm with it. I hope that’s helpful. I do notice there’s no post that deals with style basics such as 2 vs 3-button however, or navy vs grey. I’ll put that on the list. And if anyone wants a lot more people, there is also of course my book. You can follow the discussion on How to buy a suit by entering your email address in the box below. You will then receive an email every time a new comment is added. These will also contain a link to a page where you can stop the alerts, and remove all of your related data from the site. I’ve seen you reccomend Austin Reed a few times when it comes to RTW, why is that? Is it better quality than a RTW suit from somewhere like Oliver Brown? As a student with only about £400 to spend I want to make sure I get the best for my money! Also to follow up obviously alterations are a good idea, but if I am buying a suit and I am probably a 39 chest should I buy a 38 that is probably the tiniest bit too small, but younger looking, or a 40 that makes me look more like im in my 40s than my early 20s! Look up the post ‘Change anything but the shoulders’. Essentially, see which size fits best on the shoulders and neck, rather than the waist. You can alter the latter very easily, indeed most of the shape all the way down the jacket, but the shoulders are much harder. Most men do it the opposite way round, buying the jacket that fits best on the waist. Also remember that one brand’s 38 is another’s 40. It is not a measurement of the jacket. It is a measurement of the customer they think should wear the jacket. And brands have very different ideas about that. Great set of articles . I know it’s not your level but would be so good to see you compare ‘High Street’ suits around the £400-£500 mark. Sure, I’ll have a bash again at some point. Do bear the points in that HTSI article in mind though, and compare places yourself. I appreciate your advice concerning suit construction and proper model. Are you familar with the Oxxford suit that’s made in the United States? If so, would you please comment on the quality of garment as well as your opinion of the models of the garment. 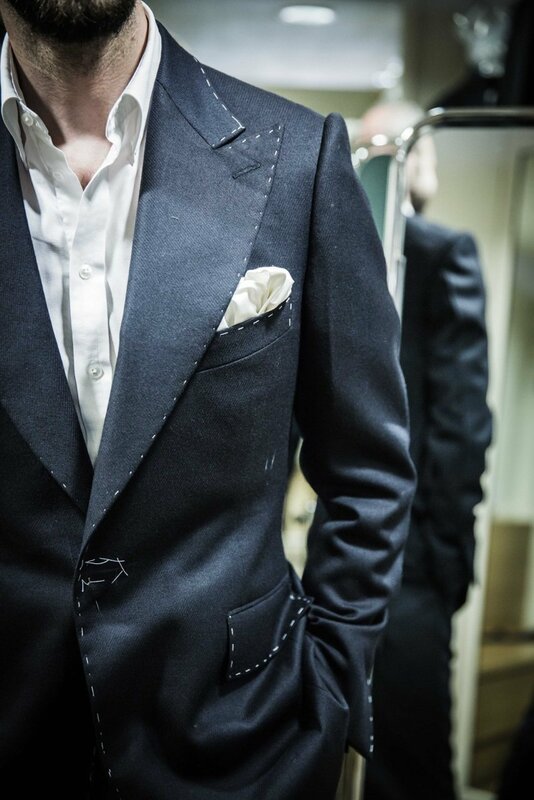 I personally prefer the classic italian silouette and have found that some suitmakers,particularly americans, have trouble with the italian model. They prefer to the more boxy Ivy leaque look and only grudgingly will make their own italian version,and it shows. No, sorry Scott. I know the people at Oxxford, but I have no experience of their suits. I may be mistaken, but I thought you were publishing a new book for 2013? I love to read your articles and I love your style. I was wondering where you had the suit made as shown on the picture. I love the sharpness of it. with the trousers I am not too fussed and I am put off by the prices charged for making up the trousers. I don’t envisage this affecting the overall look of the suit however I am not an expert on these matters so I would value your opinion on this? It shouldn’t make a difference, no. Given that one wants to properly care for a quality suit, there is a lot of advice floating around out there. I have been told by a tailor, and read on other sites, that if one needs to get the trousers of a suit dry cleaned, they must get the jacket dry cleaned as well even if the jacket does not require a cleaning. Do you find this to be true? Any thoughts, as always, are much appreciated.